Create screenshot with palm sweeping . If you have any questions, leave your questions in the comment box below, or discuss it in our S4 forum. More Galaxy S4 tips and tricks can be found in Galaxy S4 Tips page. 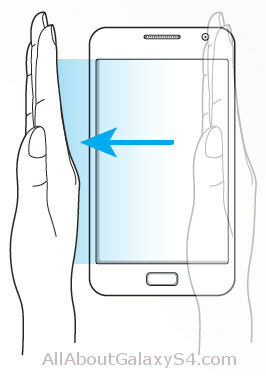 Samsung Galaxy S4 manual in more than 20 languages can be read or downloaded (PDF) from Samsung Galaxy S4 manual page. The new features in Galaxy S4 are explained in Samsung Galaxy S4 features explained page. When you need input, you can long tap the text area, and the last item in clipboard can be pasted. To see or select other items in the clipboard, you need use Samsung keyboard. In Samsung keyboard, long tap the button with mic, a small window will pop out and you can find the clipboard in the second row next to setting gear.